My Aunt Mary made this and brought it to every family gathering, calling it Green Stuff. She and her husband, my Uncle Walt, only had one child, and he didn’t live nearby, so they would come to my grandmother’s house for family holidays. Uncle Walt was Nana’s oldest brother, and he was born in the very early 1900s. His stories of life back in the day were wonderful – he delivered milk and all kinds of things. I made this recently for Thanksgiving, and about half of it was eaten. Which is half more than I thought would eat it. It’s definitely a nostalgia food for a lot of people over 40. This is a fun, gluten-free recipe! I can’t guarantee it’s family-friendly, as none of the kids would try it. It can also be (if you double check ingredients!) a wheat free, soy free, egg free, peanut free, fish free, and shellfish free recipe. Boil 1 cup water. 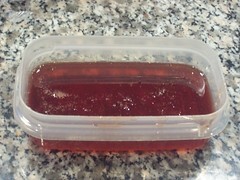 In a large bowl, dissolve Jello in boiled water, whisking for a couple minutes. Whisk in cold water and pineapple juice. Blend cream cheese into Jello mix until well combined. Let chill in bowl for about an hour to an hour and 15 minutes, until thickened, but not set. Spray a silicone bundt pan with cooking spray (I like Trader Joe’s Coconut Oil Spray). Fold in walnuts and crushed pineapple, and pour into bundt pan mold. Chill until set – 2 hours or overnight. Unmold by turning over onto a serving plate. If it doesn’t immediately pop out, run under hot water for a second, then try again. However, this is why silicone is lovely – it’s a lot easier to unmold anything if you use a silicone mold. Serve. Either try to avoid bringing up the dishes coming to life in Better off Dead, or embrace it! When my cousin offered to make me a kale smoothie, I was skeptical. Very skeptical. But it was pretty good! Then I went home and tweaked it over a few months. Now I make it for breakfast every morning. I don’t even feel guilty when I eat a cider donut with it, it makes me feel that virtuous! Pour into a glass and enjoy! This will serve 1 or 2 people depending on how hungry/thirsty they are. This is now one of my two go-to frostings. If a cupcake is going to have chocolate frosting, it’ll have this fudgy frosting. If it’s going to have a vanilla frosting, it’ll be buttercream. My dear chocoholics love this, and find chocolate buttercream less satisfying. This is a delicious gfcf, gluten free, family-friendly recipe! It can also be (if you double check ingredients!) a wheat free, dairy free, soy free, egg free, tree nut free, peanut free, fish free, shellfish free, top 8 allergen free, and vegan/vegetarian recipe. 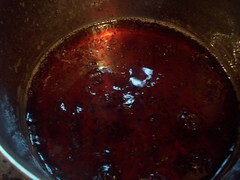 In a small saucepan over medium-low heat, melt the chocolate and butter/margarine. When it’s melted, whisk in the milk and confectioner’s sugar. The result should be a thick, fudgy frosting. If it’s too thin, add a tablespoon or two of confectioner’s sugar. If it’s a little too thick, add a teaspoon or two of milk. Frost any cupcake with this frosting – chocoholics will approve! You can also add a simple fondant decoration to go along with a lunchbox theme. This is inspired by the Smitten Kitchen Whole Wheat Goldfish recipe. This is a delicious gluten free, family-friendly recipe! It can also be (if you double check ingredients!) a wheat free, soy free, egg free, tree nut free, peanut free, fish free, shellfish free, corn free, and vegetarian recipe. Using a food processor, combine all the ingredients. Let run for around 2 minutes, until it all comes together in a ball. I have a small Cuisinart, and it’s still large enough for this. Wrap the dough in plastic wrap, or put it in a plastic bag, and place in the fridge. Let it chill for 30+ minutes, until firm. Preheat oven to 350F when you take the dough out of the fridge. Place a sheet of plastic wrap on your counter or other surface. Plop the dough in the middle of the plastic wrap. Put another sheet of plastic wrap on top, then use a rolling pin to roll the dough out to a thickness of about 1/8th of an inch. Gluten-free dough requires slightly different handling for rolling out, and the technique that’s worked the best for me has been rolling out between layers of plastic wrap. Let bake for 10 minutes, then check for done-ness every 2 minutes. Crackers are done when there’s just the slightest browning on the edges. Remove from the oven to a cooling rack and let cool on the cookie sheet for at least 5 minutes. Transfer to a cooling rack. When cool, transfer to an airtight container. Serve as a side in lunchboxes or as a snack any time. We love our delicious cornbread, but recently we started playing around with the recipe a bit, and found that a few tweaks made the cornbread even better. One variation includes dairy, and the Cheesy Cornbread Biscuits are delicious, but the Cornbread Biscuits without cheese are yummy, too! This is a delicious gluten free, family-friendly recipe! It can also be (if you double check ingredients!) a wheat free, dairy-free, soy free, egg free, tree nut free, peanut free, fish free, shellfish free, vegetarian, vegan, and top 8 allergen free recipe. Grease 2 cookie sheets or line with Silpat or Reynold’s Release foil. Preheat oven to 350. Add wet ingredients to the bowl, and mix until just blended. It will look something like brownie batter. 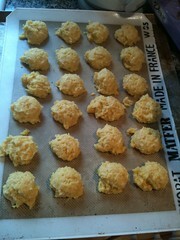 Using a small cookie scoop/ice cream scoop, scoop balls of batter onto the prepared cookie sheets. Leave at least 1″ between each biscuit to allow for them to expand while baking. Bake 12-15 minutes or until the top is firm and lightly brown. Serve warm with some butter or butter substitute. This goes great with ham, bbq ribs, chili, bbq chicken, ham and bean soup, or anything with a Southern flavor. 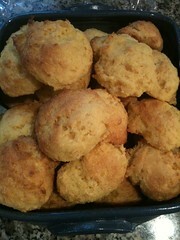 This is a wonderfully moist cornbread biscuit that gets devoured in our house and tastes equally good without eggs. One afternoon my daughters wanted to cook dinner for the family. The younger two wanted to make desserts, so my youngest made GF GrapeNut pudding, my middle daughter made a fudge pie from the Joy of Cooking, and my oldest decided to make the main course, with a side of pasta. After much searching for the perfect recipe to make for dinner, Mackenzie found a Chicken and Chive Roulade recipe in the wonderful Silver Spoon cookbook. We made some adaptations to add a bit more flavor and to make it gluten-free, as well as creating more detailed directions. This recipe is not dairy-free This is a delicious gluten free, family-friendly recipe! It is also (if you double check ingredients!) a wheat free, soy free, egg free, tree nut free, peanut free, fish free, and shellfish free recipe. This recipe is Faux Fast Food, and can be made in under 45 minutes. Have a large skillet with a cover ready, as this cooks on top of the stove. You will also need 8 toothpicks. 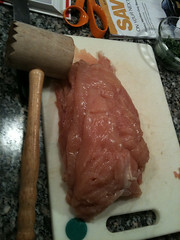 Cut each chicken breast in half length-wise. Lay between two sheets of wax paper and pound each one with a meat mallet to approximately 1/4 to 1/8 inch thick. Divide the 1/4 cup butter into 8 equal pieces. Lay out every piece of pounded chicken breast on a piece of wax paper or a cookie sheet. On each place 1 piece of butter, 1/8th of the chives, and 1 tsp chive cream cheese. Roll each piece of chicken length-wise, and secure with a toothpick. In a bowl, combine flour, parmesan, oregano, thyme, salt, and pepper. Dust each roulade with the flour mix, and then dredge the bottom of each piece of chicken with the flour mixture as well. Melt the remaining butter and the olive oil in the large skillet over medium-high heat. Place each piece of chicken in the skillet. Cook until browned (about 2 minutes), then flip. Cook each side for 2 minutes, until browned on all sides. Sprinkle the chicken with any leftover chives when serving. 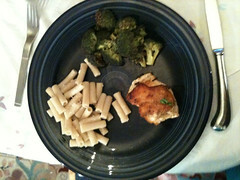 Serve with pasta (Mackenzie tossed her pasta with butter and parmesan), quinoa, or potatoes and a roasted vegetable (we had roasted broccoli and asparagus). 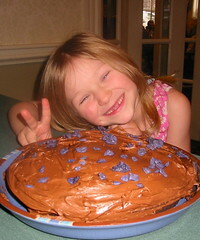 Our family has been living gluten-free due to Celiac Disease for over 6 years. Gluten is a protein found in wheat, rye, barley, and very similar to the protein found in outs. This means that any food needs to be made specially – bread, pasta, cake, pizza crust, pretzels, cookies, etc. Finding the Betty Crocker gluten-free mixes was a wonderful surprise! Over the past 6 years there has been a huge increase in availability of gluten-free products, but most of the GF products have been found in the health food aisle of the grocery store or in a specialty store. However, gluten-free products are becoming more mainstream as the number of people diagnosed with celiac disease rises, as well as the number of people living gluten-free for other reasons. Last summer, General Mills introduced a new, gluten-free formulation of Rice Chex (they changed the sweetener from barley malt to another sweetener). In addition to becoming more mainstream, gluten-free products are becoming much more commonly available and found in most grocery stores. 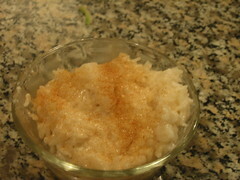 I love rice pudding, it is so incredibly soothing and delicious. It’s also very creamy, and it took me some time to get a rice pudding recipe that I thought was creamy enough without using dairy. This is the recipe I’ve been making for a while, and it’s one that my oldest daughter, Mackenzie, will sometimes make on her own. I’m not a fan of raisins, but some dried cranberries can be a nice addition at times. Sometimes when I use coconut milk I’ll add some flaked coconut, too. There are plenty of variations possible, depending on your mood – my middle daughter puts chocolate syrup on top when she eats it! 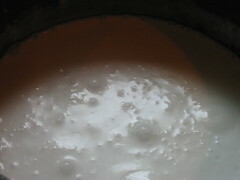 In a medium pot, combine salt, rice, and milk substitute. Stir well, and bring to a boil on high heat. Stir well once it is boiling, bring heat down to low, then cover and set the timer for the cooking time recommended on the rice packaging. Don’t leave the rice to simmer unattended! 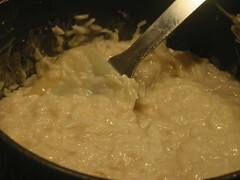 When using a milk substitute rather than water, the rice tends to clump, so stir it about every 5 minutes while it cooks. When the timer goes off, test the rice for done-ness. You may need to cook it for 5-10 more minutes than usual. When the rice has finished cooking, take it off the heat, and add the vanilla and sugar. Use a silicone spoonula or something similar to gently but completely combine. Once the sugar and vanilla is assimilated, stir in any desired optional add-ins. Cover again, and let the flavors meld and the rice pudding cool for about 15 minutes, then spoon into a ramekin and eat warm. Yum! What a delicious, creamy, and soothing comfort food! This is also great for kids with a “crummy tummy”, or any day when you want food that feels like a warm hug. Refrigerate any leftovers, then warm individual servings in the microwave or on the stovetop. Serve as is, or with a bit of cinnamon sugar sprinkled on top, or with a bit of any of the suggested add-ins.